A recent article by The New York Times describes a software application that will grade student essays using artificial intelligence to ease professors’ workload when working with large quantities of students like the ones registered for MOOCs. The article generated many comments; most of them can be classified under two categories. First are the ones questioning such approach based on the poor quality of the feedback and the low level of human interaction which they consider the key to real high quality learning like what happens in Ivy League kind of universities as Harvard, MIT, Yale, Berkeley and the like. The second category refers to the people who may successfully try to cheat the system by getting positive feedback to nonsense writing or the equivalent to good grades with poor or no learning. What surprises me is how far off are these critics of the real target population whom the MOOCs really benefit. Nobody may question the quality of education at an Ivy League university is outstanding and superior to most universities worldwide, online or not, with artificial or human intelligence involved in the process, for those who can pay for it. But who, among the critics, thinks about the millions of students around the world for whom Higher Education is non-existent or unreachable? What about the thousands of universities so limited, their degrees would not be accepted by any serious accreditation agency? In Latin America, with hundreds of millions of potential Higher Education consumers, there are under ten universities qualifying in the world’s top 500 on any ranking, and not even one among the top 100. Also, if we, just for a moment ignore the people who are willing to cheat, who are not the target population, and think about those who are willing to learn and would be able to do so thanks to the MOOC’s now available; which happen to be the only education they can get. Sir John Daniel, in 2012 published an article entitled “Making Sense of MOOCs: Musings in a Maze of Myth, Paradox and Possibility” where he analyzes the attrition rates in Coursera and MITx. He reviews the numbers for MIT’s course 6.002x, Circuits and Electronics with its 155,000 registrations and 7,157 passing grade students. Daniel cites MIT’s Anant Agrawal noting “while the rate of attrition may seem high… it’s as many students as might take the course in 40 years at MIT”. It is foolish to think those over seven thousand students have a Circuits and Electronics training comparable to that of a regular MIT student, I don’t think anybody can truly believe that. What is in question is if their training is good enough to give them certain basic competencies they might be in need of, and someone interested may test them about. MOOCs are not a replacement to Ivy League education for those who can afford it. It is a new form of education for those who had nothing else or do not need anything else. What we need to bear in mind is that the MOOCs are trying to make better quality education available to a great mass of people who are currently “non-consumers” of education and such quality is currently superior by far to whatever they may be getting right now. The MOOCs are not aimed to people who are willing to cheat but to those willing to learn. I don’t think the automated offerings are trying to compete (nor pretending they are able to) with Ivy League offerings. Those who want to understand the phenomenon taking place might want to watch Harvard’s Clayton Christensen’s talk at the October, 2011 “The Future of State Universities” conference hosted by Academic Partnerships. Essentially, what Christensen says is that History has demonstrated again and again that every industry faced with disruptive innovation will eventually be overtaken by those who, in the beginning, seemed low quality available only to non-consumers. What is still to be seen is if MOOCs and online education are really disruptive innovation in education or not. That must be the discussion and not if the quality is comparable to that of Harvard and MIT or how easily can someone, with enough effort, cheat the system to get a passing grade. As early as 1949, British Psychoanalyst, Donald W. Winnicott coined the expression “a good enough mother” to refer how “ordinary” people may have normal children, in spite of the mistakes that are usual when rearing children in everyday families. Paraphrasing Winnicott we may say the MOOCs and online education offerings available today are “good enough educational offerings” helping ordinary people who are willing to learn to reach goals that had been out of their possibilities so far. Computers, Internet and AI grading software may provide a new and innovative kind of transitional space (another Winnicott concept) for learning to be nurtured if and when people willing to learn interact with people willing to teach them. Of course such transitional space is not the same as the one provided by top quality institutions and top quality professors to the best and wealthiest of the world at their classrooms, but maybe, just maybe, as I think Christensen said, it’s just a matter of time. When I was involved in “Una Laptop por Niño” (Spanish for One Laptop per Child), one of the world’s largest one to one laptop projects, in Peru, we had lots of criticism because a computer cannot replace a good teacher; some thought a better idea was feeding and vaccinating children, and others still thought better planning and teacher training was needed before even attempting to begin. The ICT industry players reacted because, in my humble opinion, their bottom line was at stake and, finally an impact study by the IADB found that the children who received a laptop had outgrown their peers by four to six months in cognitive development over a fifteen-month period. To me, the fact that, in just over two years, over 200,000 children of the most remote dwellings in the Andes and jungle of Peru were able to interact with technology and learned how to operate a computer for the first time, was good enough. By the end of my tenure, almost a million laptops were distributed or ready to go to almost one hundred thousand public schools countrywide, benefiting over six million children. There is still a lot to be done but the foundations were laid and those children had a great opportunity. 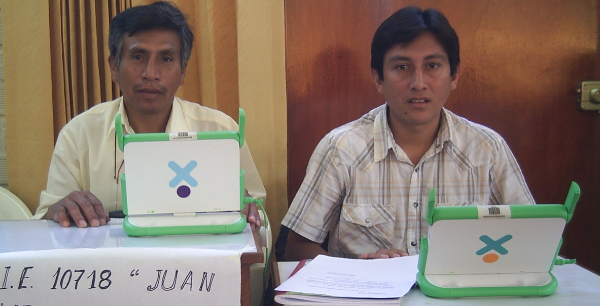 Now, when I see the criticism developing around the MOOCs and online education I cannot help but remember my experience with OLPC. It is not the best and the top breed who are at risk, but don’t let them deprive the ones at the bottom to get at least something that is good enough. J. R. Young in an article published in The Chronicle of Higher Education in July, 2012 mentions university officials fear of not being able to “do it well”. According to Mr. Rodriguez, of the University of Virginia. “These are high-quality potential substitutes for some of what universities do.” It is that potential what we should be able to help become real. Written by Oscar Becerra on April 11, 2013 in Massive Open Online Courses.